I think this is the third crock full of applesauce I’ve made this fall, and subsequently the third jar of applesauce that I’ll have eaten almost entirely solo. I don’t mean to, but then I sit down with the jar and a spoon and before I know what’s happened it’s three quarters empty. And these are quart-sized jars, guys. But it’s so good…especially warm, straight out of the pot. Mmm. I’m sure there are an abundance of crock pot applesauce recipes out there, but for posterity, I’m posting my own. So that next fall, when I need to consume a year’s recommended intake of apples in three sittings, I know where to find it. After years of generally avoiding golden delicious apples, I found out this year that newly picked ones are pretty tart and have a good flavor for apple sauce and even pie. This website has a nice list of different apples and their uses. I really like tart flavors, so I prefer Granny Smith even though they’re not “ideal” for sauce. I’ve made sauce this year with Golden Delicious, Rome, and a mix of Rome and Granny Smith (our favorite combination). Rome definitely made the sweetest sauce, so I ended up adding a little extra lemon juice to sour it up, but that’s just me. Using Rome and Granny Smith apples in this batch. I just love the mix of colors, even after peeling! About 10 medium cooking apples (will almost fill a 4 quart slow cooker), peeled and sliced. 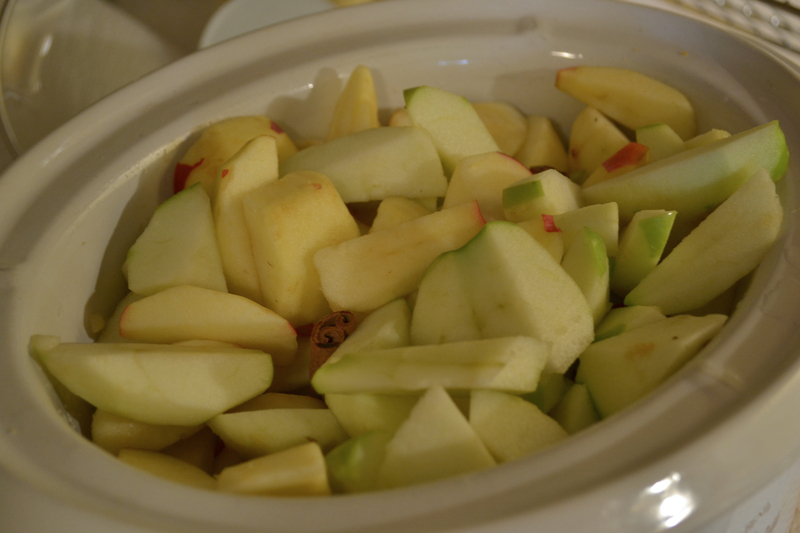 Fill the crock pot with apples, sprinkle the water and lemon juice over the top. Stick two cinnamon sticks down inside the apples, and cook on high for 4-6 hours, or on low for about 8 hours. Mash everything up, or use a food mill/food processor for really smooth sauce. I leave the cinnamon sticks in the sauce even after jarring and refrigerating it – they sweeten the sauce nicely without the use of sugar. Depending on the apples you use (it happens especially with Granny Smiths), the cinnamon sticks will turn the sauce pink, which I kind of like! Tags: apples, autumn, Daniel Fast, gluten free, recipe, snack, vegan, vegetarian. Bookmark the permalink. Sounds wonderful, especially with the weather getting colder, and so easy. I like my applesauce chunky – I’ll have to try your crockpot method!